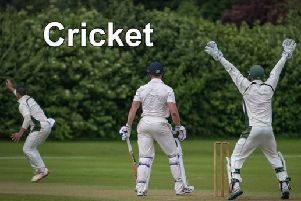 Woodhall Spa CC have set their sights on Winkworth Cup glory. Tomorrow (Thursday) the Spa men will face Bourne in the final of the county’s premier T20 competition. Three years ago Woodhall won the competition and progressed to the regional stages, only to see their run ended by a Sheffield Collegiate side. “It was a great experience, getting to the regionals in Barnsley,” skipper Jack Luffman said. “Those of us who played then would love to do it again, while the younger lads who have heard all about it want to get there themselves. “But first up is the final. The contest was due to take place last month, but a rain-affected finals day saw the two semis played before the day’s play was abruptly ended. Bourne defeated Grantham while Woodhall edged past a plucky Alford side, winning by seven runs. Spa skipper Jack Luffman believes Bourne will pose a stern test, but hopes his side can have the edge. He told The News: “I think Bourne will go into the game as favourites, and rightly so. “They’re avery good T20 side and enter three or four competitions a year. “In their captain Pete Morgan they’ve got the most destructive T20 batsman in the league. “But we’ll have a strong side available. The Winkworth Cup final will be played at Sleaford CC tomorrow night, beginning at 6.15pm. The winning side will go on to represent Lincolnshire in the regional finals in Nottinghamshire on July 30. Other teams competing will be county winners from Derbyshire, Yorkshire and the host county. On Saturday, Woodhall’s attention will turn to their Lincs ECB Premier contest at Louth CC. The contest will begin at noon.